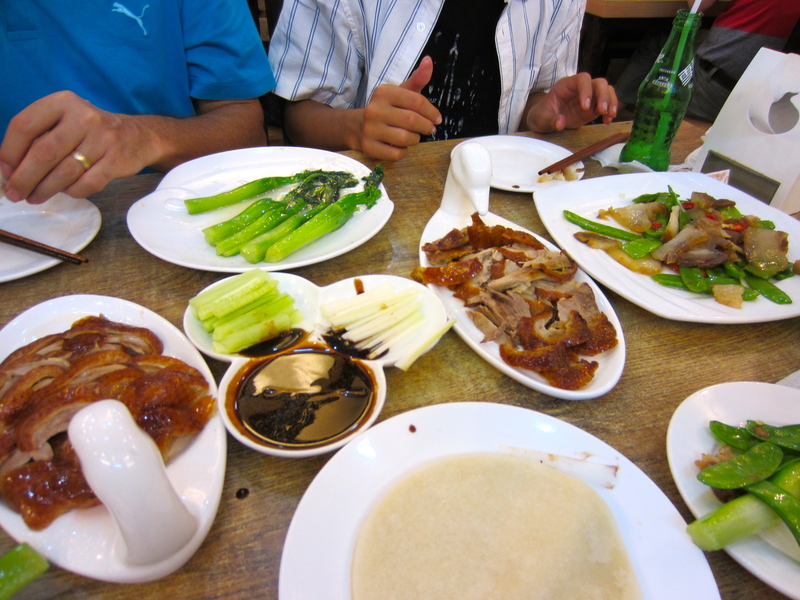 Tonight we went across the street from the Kapok Hotel where we were staying to have some Peking duck (or Beijing Duck as it is called here) in a local restaurant. I had found the restaurant the day before when taking Justin for a Subway sandwich. A nice gentlemen started speaking with me about the best duck on the street and told us to come back and try. Well, we did come back later that evening and we all loved it! We ordered a whole duck and two vegetable side dishes. The boys went crazy over the little pancakes and enjoyed slathering the hoisin sauce all over everything. 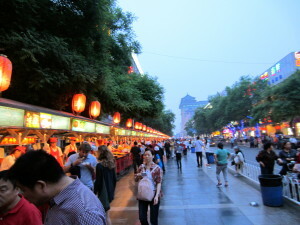 After dinner, we took a 5-minute walk down Donghuamen Street to get to the pedestrian walk on Wangfujing Street. 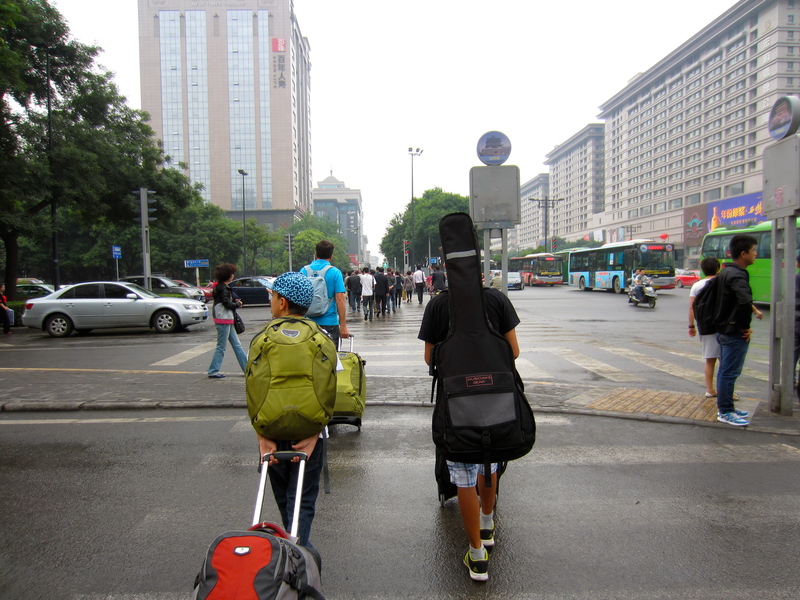 We wanted to check out this pedestrian shopping district to see how it compared to Nanjing Street in Shanghai. 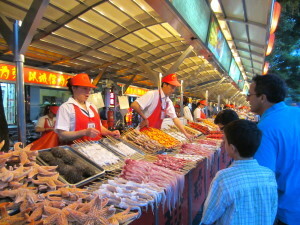 On the way there, we were surprised to find a night food stall market on Donghuamen selling all sorts of bizarre street food. 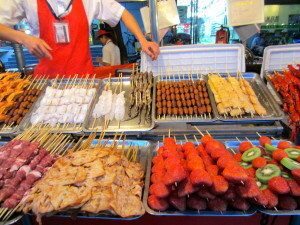 The stalls that really surprised us were selling deep fried silkworm cocoons, crickets, snakes, and scorpions. While Jordan was munching on pot stickers, Justin told me he wanted to try the scorpions. Seriously? 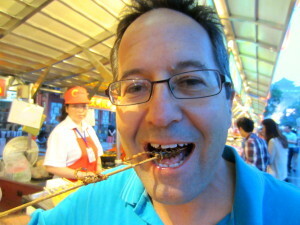 Ok, I ordered a skewer with two scorpions; the man deep-fried them and I munched the first one down. Hmmm, it simply tasted salty and crunchy. 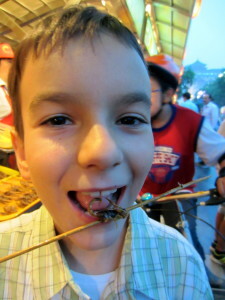 Justin did not hesitate and munched his scorpion down. Granted, they were pretty tiny, but they were scorpions! We ate scorpions! We both had big smiles on our faces and knocked knuckles. This was real father-son bonding. 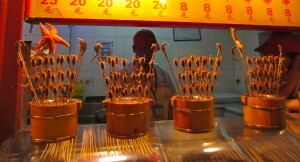 Later, we found another street food area in a small alley off Wangfujing Street, and here the scorpions were wiggling on the sticks. They were impaled, but still alive. Justin asked if we could have another round of scorpion! 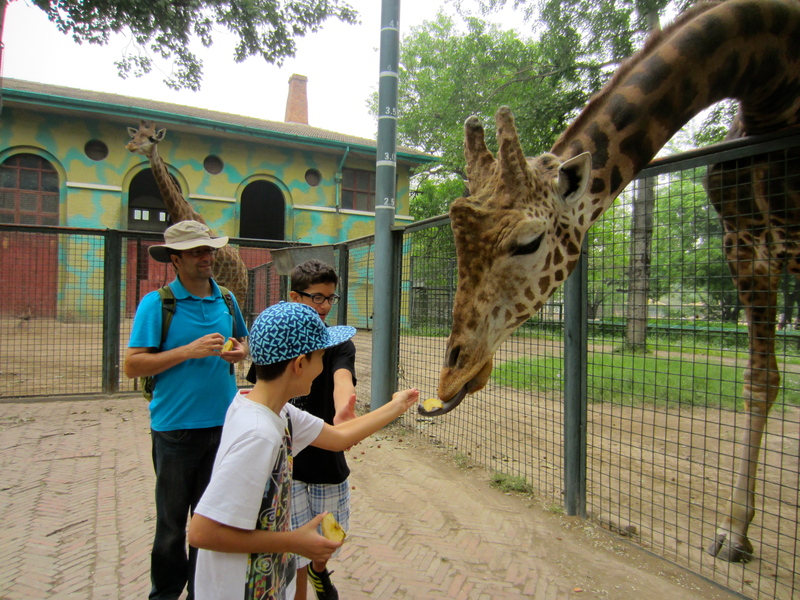 For our first day in Beijing we decided to knock the Beijing Zoo off our ‘To Do’ list. Justin has been repeatedly talking about pandas this whole week, so we thought finally seeing the pandas would quiet him. Getting to the Zoo on public transportation was easy. We had a 15 minute walk down a shady street to Tiananmen Square East Station where we went into the subway. Tickets were only two yuan (.30) a person to travel anywhere on the subway. Signs were clearly marked in English and we had no trouble navigating the subway. We wanted to get to the zoo by 9 AM because we had read on Trip Advisor that the pandas were fed between 9 and 10 AM. 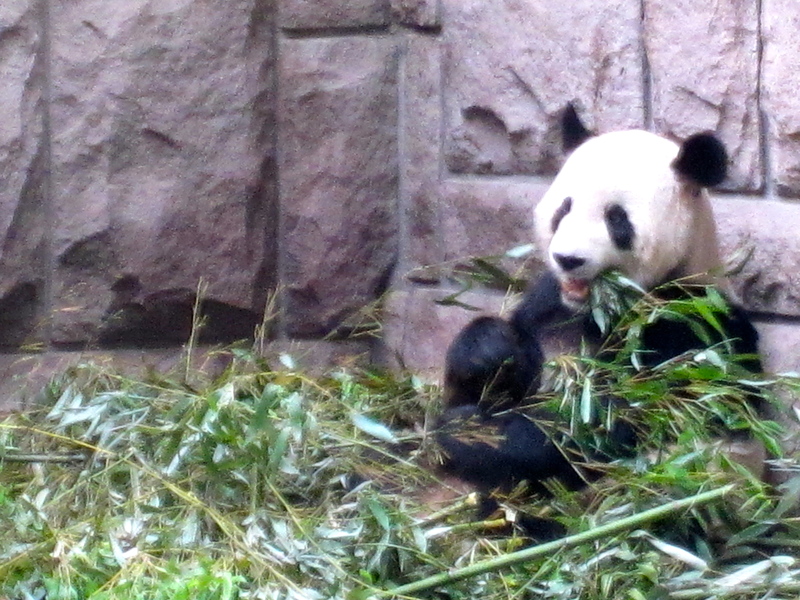 We got into the zoo just after 9 AM and immediately went to the pandas. 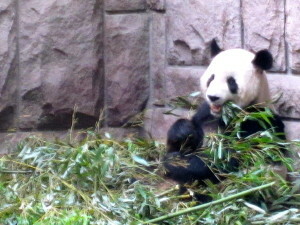 As reported, they were munching contentedly on their bamboo. We saw four pandas in different enclosures. Almost exactly at 10 AM two of the pandas stopped eating and went to sleep. It was a good thing we had gotten to the zoo early. 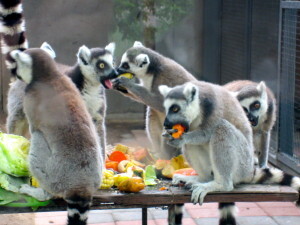 Besides seeing pandas, we discovered that the visitors are allowed to feed the zoo animals. We watched people throwing bok choy and apples to the elephants. 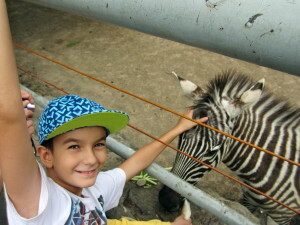 At the zebra enclosure, the zebras were munching veggies right at the fence. There was no barrier or ditch to separate the animals from the people on the other side of the horizontal wire fence, so Jordan and Justin got to touch a zebra. 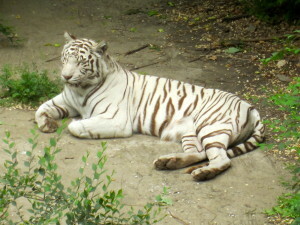 No zoo attendants around to say otherwise. Visitors could also pay a 10 yuan fee to get into a special area to feed the giraffes apple slices, which we did without hesitation. 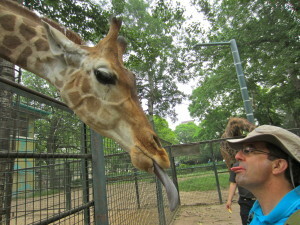 Coaxing the giraffes’ long blue tongues out to their full extent to grab an apple slice was quite cool. Also, on display at the zoo was China’s one child policy. Once we got away from the panda section of the zoo, we were pretty much the only westerners around. As our visit was on a Friday, a school day, the only kids were younger than 5 years old. There were a lot of toddlers running around, but there was only one per family. We were the only family with two children, and boys to boot. Sometimes here I think the Chinese must think I feel like a king for having two boys. China is, of course, a huge country with numerous major tourist attractions, and you can’t see many in just 13 days, although we have met a few other westerners in tour groups or with private guides who are making a go at it. 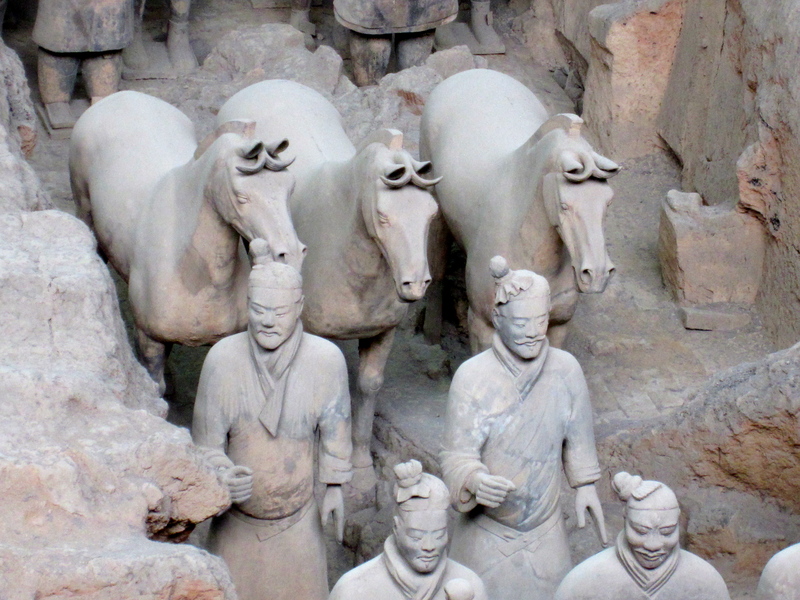 For us, seeing the terra cotta warriors of Xi’an and the Great Wall were the two ‘must see’ cultural icons of China. We knew nothing about the city of Xi’an itself, we were flying in to see the warriors, and everything else would be gravy. What else did Xi’an have to offer? We were only going to be there for two days and three nights, so we would not need much to take up the other 1½ days we were not going to be seeing the warriors. 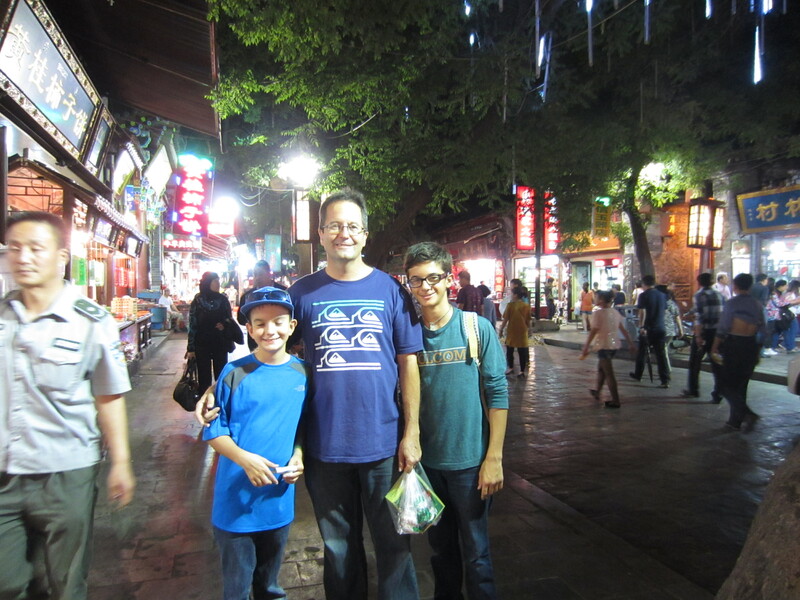 As it turned out, we really enjoyed our time in Xi’an. 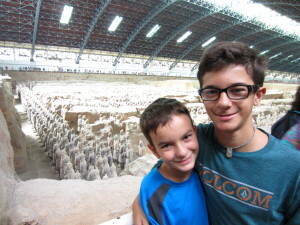 We went and saw the terra cotta warriors our first morning in Xi’an, which the boys are blogging about. We got back to the Ramada Bell Tower hotel in the afternoon and chilled for a few hours. The hotel concierge, David, who spoke excellent English, advised us to visit Huímín Jiē – the ‘Muslim street’ – located behind the Drum Tower. This was only a 5-minute walk from the hotel. The street is pedestrian only and about 500 meters long. We were glad that we decided to make this an evening visit because the street was lit up with small, colorful neon signs and strings of light bulbs, and light streamed out from the open front businesses. There were Muslim men in skullcaps and women with headscarves; this street was not just Muslim in name. Stores alternated between tourist knick-knack shops, restaurants, and food stores. 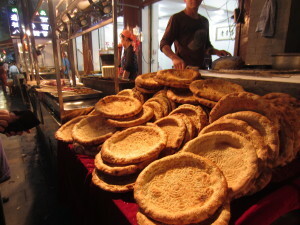 The restaurants had food cooking on the sidewalks: meat skewers over charcoals, simmering pots of pigs trotters, savory pancakes, fresh sesame flatbread from round ovens. 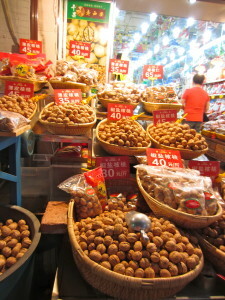 The food stores primary offerings were fresh roasted walnuts, dried dates and dried persimmons. Gigi could not resist buying some silk scarves for 10 yuan ($1.50) each and some bracelets made from jade beads for only 15 yuan each ($2.50). Xi’an is one of the ancient eastern terminus of the Silk Road, and I imagined that in some small way this street still provided a flavor of what the city might have felt like several hundred years ago – the smells of the roasting meat and walnuts, the shops selling silks and jades, the jostling in the narrow side lanes. Dinnertime rolled around. Most of the restaurants looked a bit too ‘local’ for us on this street and we were discussing going back to the modern mall just one street over to look for a restaurant, but a sudden rain shower motivated us to go inside what looked to be one of the nicer restaurants. It had a menu with pictures so we could order. To our surprise, there were many vegetable plates offered. It is hard to get enough vegetables when eating in restaurants! Gigi and I ordered only vegetables, and the boys ordered noodle soup and soupy dumplings. The food was quite good, and cheap. We struck up a conversation with the only other westerners in the place, a father and son from Germany who are touring solo like us. Outside afterwards, some Chinese ladies fawned over Justin. We don’t know if it is his light colored skin, his eyelids or nose, or the whole western facial package, but he, and Jordan too, get stopped by people who want to take their picture with them. They are polite and we just wonder how few Westerners these Chinese have seen in real life. Gigi and I do not get the same attention as the boys. Jordan’s ego was getting a boost from this attention while Justin just smiled sheepishly and wished they would go away. Our second day in Xi’an was the ‘gravy’ day, and it turned out to be a very packed day. 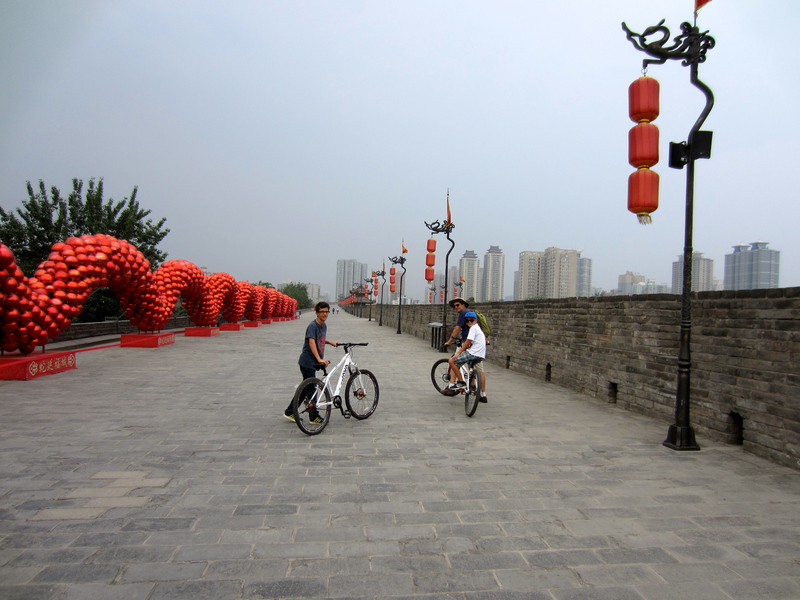 Xi’an has a 600-year-old rectangular stone wall encircling the old part of the city. You have to pay an entrance fee to get up on top of the wall. The wall is at least 10 meters high and wide enough on top for 3 car lanes. It is 13 kilometers in length. We rented bicycles and rode around the wall. This was a great activity for the boys to burn off some energy. There were barely any people on the wall because of the 40 yuan charge. It took us 90 minutes to ride once around. In Lucca, Italy, we had also ridden bikes on the city’s defensive walls. Those walls were as impressive at Xi’an’s, but much smaller in length, and much more crowded because it was free to go up on the wall in Lucca. 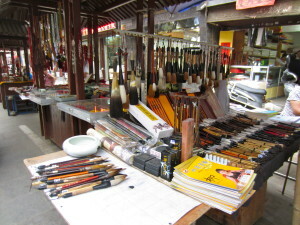 After we descended the wall, we took a walk through an old brick building neighborhood close to the East Gate whose shops specialized in artist paintbrushes and paper. This looked to be the oldest preserved section of the city. 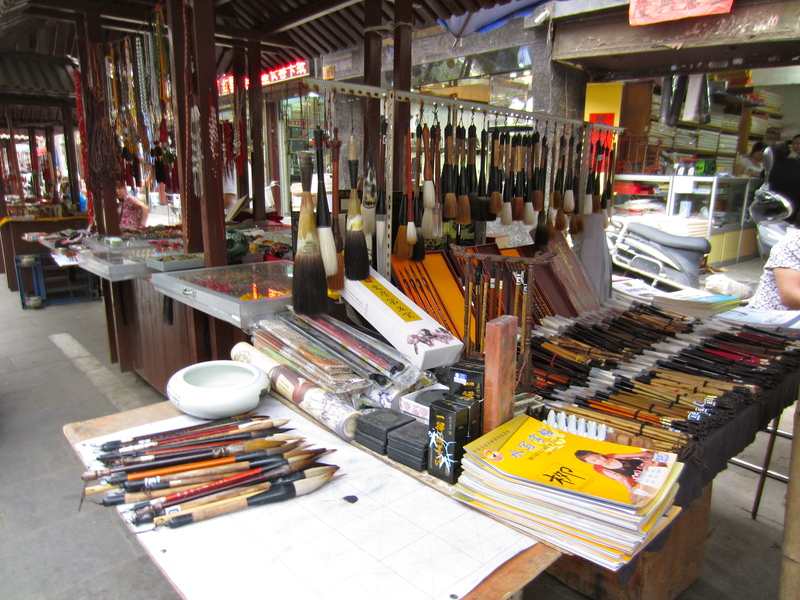 Besides wondering at the diverse, and often huge, Chinese paintbrushes in the store windows, we were serenaded by songbirds in cages and street vendors playing round clay flutes that they were trying to sell. 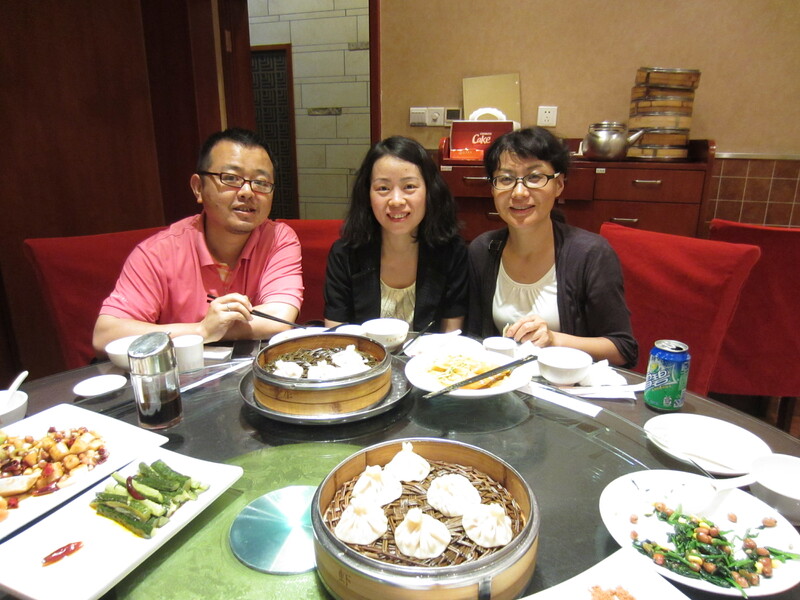 That evening, we had a date to visit a local family’s home and go out to dinner with them. 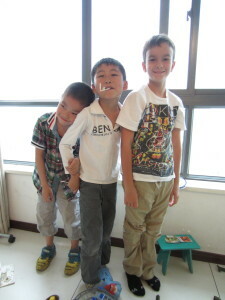 Jordan has a Chinese friend back in San Carlos whose parents were born in China. The mother, Sally, has been following Gigi’s Facebook page, and when she realized we were going to China she emailed Gigi with the offer of some contacts in China. One old high school friend of Sally’s was now living in Xi’an. This man’s wife answered our email, her husband was in Munich on business, but she would be delighted to invite us over. She has a 7-year-old son. They lived in the High Tech Development District of the city, which was a 20-minute taxi ride from our hotel. Just getting a taxi turned out to be a 30-minute ordeal, but we found one and made it out to her neighborhood. Looking at all the high rise apartments, we really did not think we would find her building, let alone her apartment, but right when we got out of the taxi, Grace came running over to us. She had been waiting out on the street for us for 40 minutes. Of course, we were easy to spot. Grace took us into her neighborhood. She said 10,000 families lived in this neighborhood of high-rise apartments. First thing that struck me was that the entrance was gated and guarded. How very un-socialist, I thought, this is a gated community like we have back home. Once inside, the exterior grey bleakness of all the buildings faded to the background. Between the buildings were meandering pedestrian lanes in a park-like setting. Lots of kids were laughing and playing, the most we had seen since being in China. Grace’s apartment was on the 26th floor. When we got inside we were greeted by her son, his friend, and his friend’s mother, Abbey. Wow, 4 boys in one little condo. Justin immediately started playing with the boys who were building with plastic train tracks. Grace and Abbey both spoke English quite well. Abbey is a document translater who studied English at University. 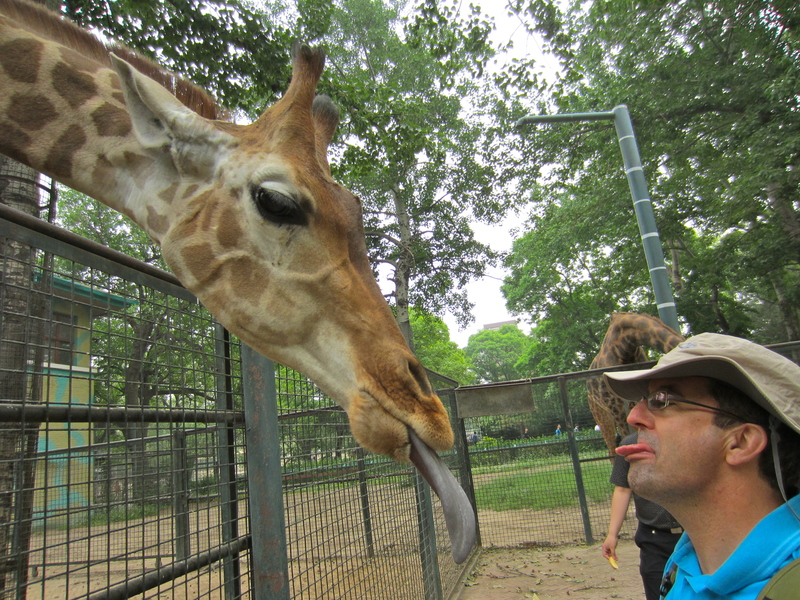 We chatted for a while about California, our trip, condo prices in Xi’an and air pollution. The boys got to hold and pet the pygmy hamster. We went to a local restaurant for dinner and found that Grace had reserved a private room for us. Abbey’s husband joined us for dinner as he had just gotten off work (He is the editor of the local newspaper and wants to interview us for an article.) Almost immediately the food started to arrive. We stuffed ourselves on Chinese food, some of which we recognized from restaurants at home. One dish was wok-fried Chinese yams. We also had wok fried-lotus root with bacon. We appreciated, however, the different variety of ingredients from California Chinese food and the complete lack of cornstarch that is so commonly added to the sauces of the dishes at home. We were complimented on our proficiency with chopsticks. 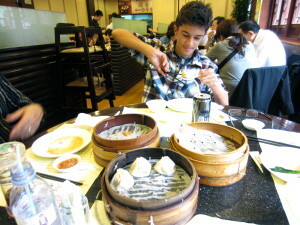 Jordan and Justin went wild on the soupy dumplings. Our group of 9 people polished off 60 dumplings, a mixture of beef, pork and shrimp, which was 10 separate orders. We had brought a chocolate mousse cake from the hotel as a gift, and we ate it for dessert. Our hosts, who we had just met, refused to let us pay our share of the meal. That was quite unexpected, and we thanked them and told them we would repay the courtesy when they come to visit California. It might happen. Grace and her husband have vacationed in California once already. Our third and final morning in Xi’an was getting up and out of the hotel and off to the airport. 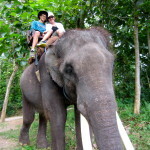 When we had arrived we had taken a taxi ride from the airport. This was almost an hour drive. To go back, we took an airport shuttle bus whose city stop was a 10-minute walk from our hotel. We were the only Westerners on the bus. It was an easy trip and cost half the price of the taxi. Oh, what a difference a few days makes in a place. We were travelling like the locals. Xi’an is a huge city, but we got a good feel for the place after only a few days. 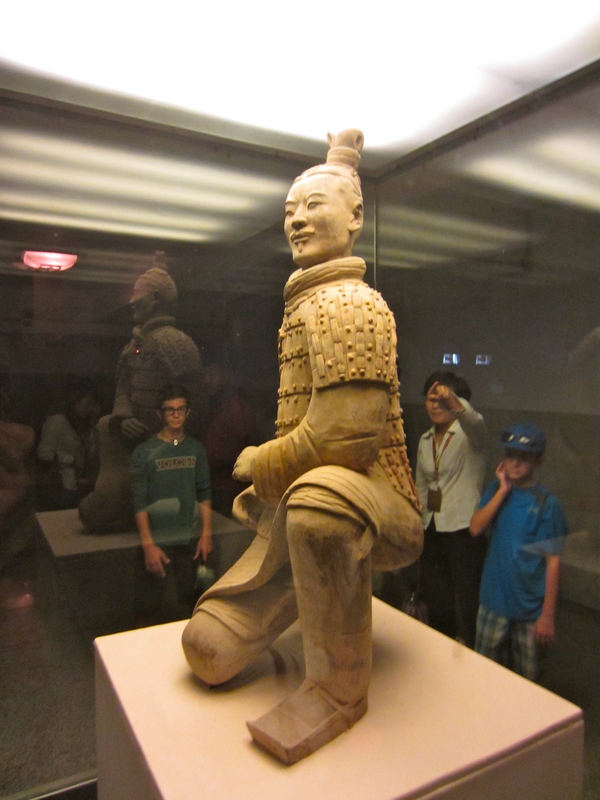 We were ready to leave, but also happy that we did not simply come for the terra cotta warriors. We are finishing up our first leg in China today. 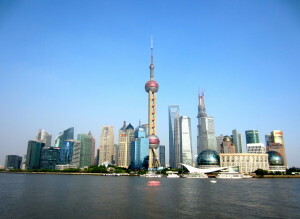 For me, Shanghai has been quite surprising. ‘Seeing is believing’ is an apt phrase for experiencing the capitalist economic miracle of this city in a Socialist country. We had done very little ‘homework’ preparing for China. The only Chinese words we came prepared with were ‘hello’ and ‘thank you.’ In the waiting lounge at the Singapore airport, we were madly downloading information on the cost of the taxi ride from Pudong airport into Shanghai, the dollar-yuan exchange rate, and ’10 things to do in Shanghai’ lists so that we could read about them during the plane ride to Shanghai. We knew Shanghai’s reputation as a city of skyscrapers, the European influence from the ‘concessions’, and that it had 20 million inhabitants. Our friend Stuart in England said Shanghai was his favorite city in Asia. 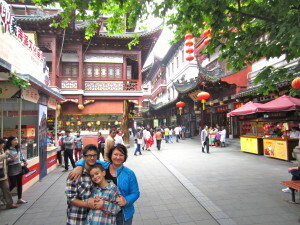 Our friend Pearl in Singapore said that Shanghai was like Singapore, just dirtier. This about sums up our preparation for Shanghai. Maybe it was because of this shallow preparation I experienced a very brief panic attack in the plane coming here. China was so outside my comfort zone. These things kept running through my head: ‘nobody will speak English’, ‘communist country’, ‘air pollution’, ‘dead pigs floating in river’, ‘rat meat passed off as muton meat’, ‘people spit everywhere’, ‘lead paint in children’s toys.’ Western newspaper headlines are generally do not paint China in a positive light. The rat meat-as-mutton story broke just days before we left Singapore. The air pollution in Beijing story hit a few months back, and in comparison it made Los Angeles air quality sound pristine. Two articles in the paper I was reading on the plane talked about the ban on communist party members hosting banquets and a university student who was not arrested for suspicion of murder because her grandfather was a communist party official. Those article topics really would not affect our travels, but they did put the seed of worry into my mind about being in a one party state. 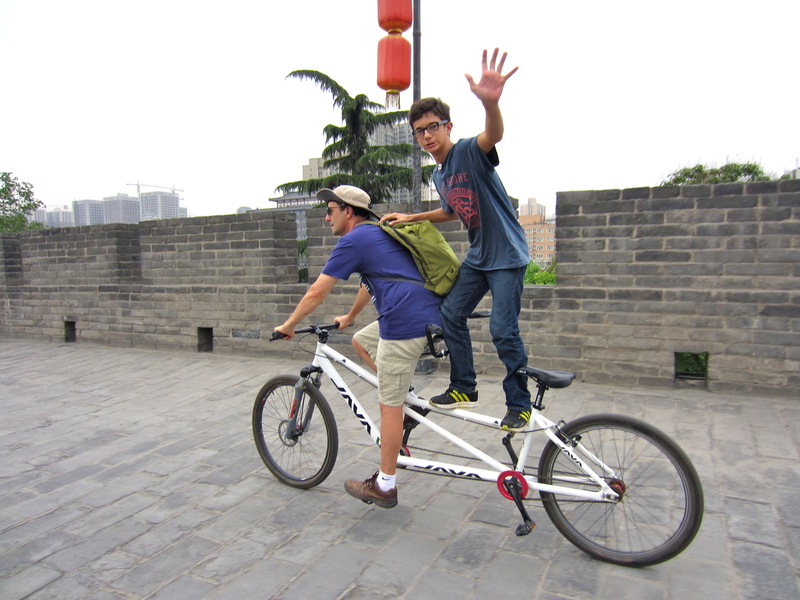 I must say, too, that for most of my life my image of the Peoples Republic of China was a closed country, populated by people wearing Mao caps riding bikes, a country diametrically opposed to American values. This was a pretty deeply rooted prejudice in my psyche. How did the western media and my own indoctrination fare against what we have experienced so far? 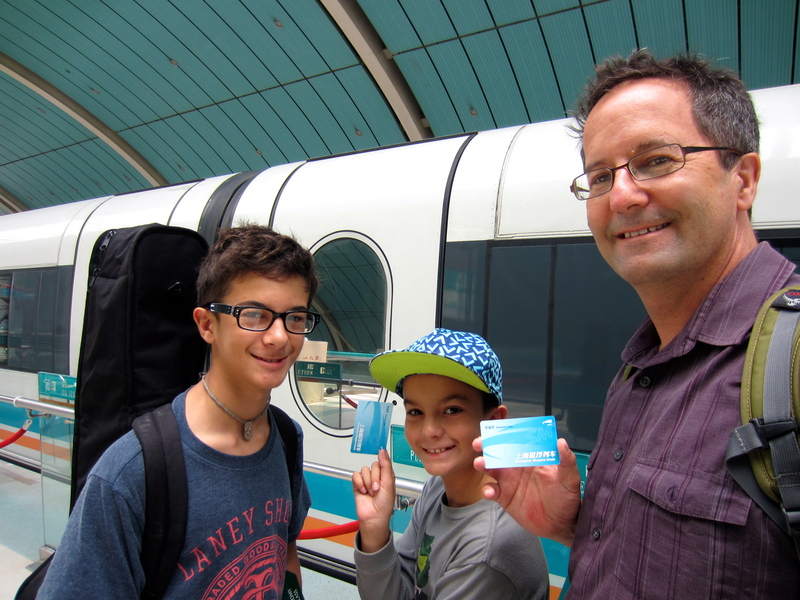 When we got off the airplane at Pudong airport, we breezed through passport control. Whew! First gauntlet of the police state cleared. Cash machine was 10 meters past the passport control and our bank card worked! Electronic connection with international banking system no problem! (does the Chinese government now have my PIN number? Paranoia!). Big, clean, and empty airport. Where are the hordes of people? First billboards seen advertised Lancome, Bulgari, Brad Pitt pitching Cadillac. This is a Socialist Workers’ State? Taxi ride into city took 45 minutes on a freeway, cost $40, and the driver took us straight to our hotel. Check-in, up to the 7th floor to our two bedroom ‘service apartment.’ Safe! Apartment clean and roomy, two flat screens with cable providing ESPN, CNN and HBO; beds a little firm, but comfy. Dinner in hotel restaurant was a mix of hamburgers, wonton soup and crispy duck. We cruised through our first day’s challenge of navigating China. Let’s see… Language barrier did not prevent communication for basic needs of transport, food, and shelter. ‘Dirty’ did not exist to our hotel. Food was good. Tsingtao beer was cheap. We are connected to the outside world with wifi connection in the hotel lobby. Gigi can even use our VPN to access Facebook. Feeling pretty normal so far. We went to sleep at ease. 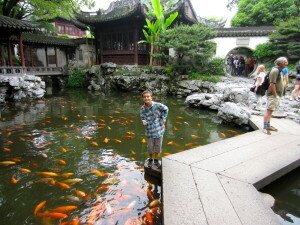 On our first morning, we decided to walk to YuYuan garden and forage for breakfast along the way. Within two blocks from our hotel we found a Chinese run French style bakery and had croissants and muffins for about $3.50. 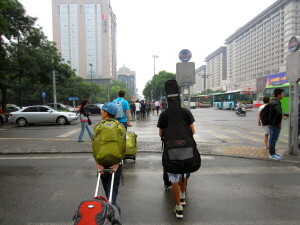 We were on Jinling Street, which had several music stores, which was very cool. Jordan went in and played on a Gibson Les Paul. He was hoping the guitar prices in Shanghai would be cheap and he could buy a Gibson, but he was disappointed. YuYuan garden was quite beautiful. 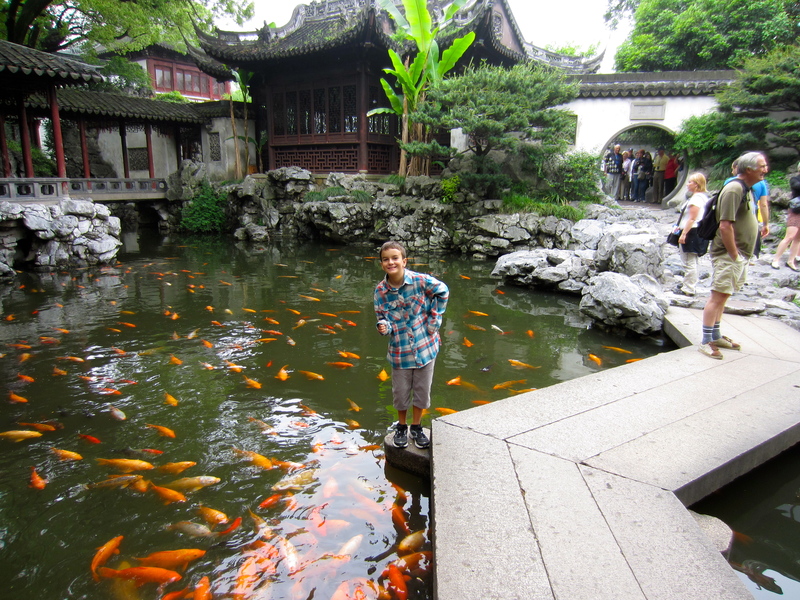 Outside the garden was a large pond with giant koi that Justin just loved. An elderly French man offered to take a family photo of us on the zig zag bridge. We started talking and found they lived in Paris and were doing a 21 day guided tour of China. The wife got to hold a baby panda in Chengdu, which really had Justin jealous. He is still mad that we did not put Chengdu on our travel itinerary so that we could visit a panda reserve. He will just have to wait until the Beijing zoo to see a panda. Another small world anecdote came about when we told the couple we had stayed in Grimaud for 3 months. They vacationed last summer for two weeks in Port Grimaud, so we had that to talk about as we stood surrounded by tourists and koi. 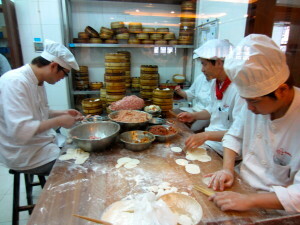 Outside the garden, we saw a long line of people waiting to buy shanghai soupy dumplings from a take out window. We went into the restaurant and sat down for a meal of these dumplings. Yum! The boys are now dim sum fans. After lunch, we walked Fang Bang/Old Shanghai road. Gigi bought name seals for the boys. We wandered through and old neighborhood of single story buildings on our way back to the hotel. Right next to this neighborhood was a giant hole that would soon be a high rise. I imagine in 5 years that neighborhood will meet the same fate. 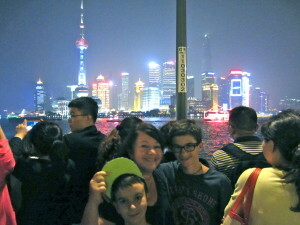 We took a 50 minute boat cruise on the Huangpu river our second day. The other boat passengers included a tour group of Quebecoise, which had Gigi very excited. We chatted with one couple, mostly in French, and found they came from Sherbrooke, which is where many of Gigi’s relatives live. We visited Sherbrooke a few summers back, so another small world story finds itself here. After the boat ride, we headed for Nanjing Road, and here we found the hordes of Chinese crowding the Bund waterfront and strolling the pedestrian section of Nanjing in the early evening. We ate dinner at a Korean BBQ restaurant on the 5th floor of a mall building. It was modern and rather elegant. We were the only foreigners in the restaurant, and it was packed. The boys loved cooking the fresh meat on the real charcoal heated griddle in the middle of the table. Justin said he was getting a cooking lesson. We had a fantastic meal for only $40, probably a good sum for the Chinese, but a similar Korean BBQ meal in California for four would easily be $100. On our last full day in Shanghai, we went to the Shanghai museum and walked over to the old French Concession part of town. The museum was a 4-story building with a central atrium. We visited the bronze, jade, and painting sections of the museum and learned quite a bit about these Chinese art forms. Our stroll through the Xintiandi area was not so successful. Truly, trying to walk for walking’s sake while discovering neighborhoods and their architecture is very difficult with the boys. They have absolutely no interest in this type of tourism and regularly let us know how they feel about it. We did not find the French architecture or boutique stores were hoping to find. We did cut through Fuxing park, and if we had had more time I would have loved to just hang out in that park. It was cool and shady and vibrant with both locals and expats. Frisbees, American footballs, rugby balls and kites were flying around the open field. A lady was singing opera under a tree, a man was playing a violin-like instrument, and kids were trying to net small fish in the pond. We found our lunchtime meal again in a mall, this one very upscale on Huaihai Road. The boys were excited because we had stumbled upon a Crystal Jade restaurant. We ate at this restaurant chain twice in Singapore, and the boys loved the fresh noodles and soupy dumplings. This was yet another high class dining experience in Shanghai for about $50 for a family of four. We finished the day with an acrobatics show at the Shanghai Circus World. The show was called ‘ERA.’ This troupe has to have ties with Cirque du Soleil; the production had all the elements of a Cirque show. The acrobats were 100% Chinese, though. While the transitions and costumes did not quite match the flair of a Cirque show, the acrobats were fantastic. The finale, and absolute best part of the show, was the motorcycle riders inside the spherical metal cage. The final ‘To Do’ thing on our Shanghai list was to take the MagLev train to the airport. Jordan was most excited to do this. A tourist brochure stated that the train could go up to 450 km/hr. This was the fastest train on the planet. The ride from town to the airport lasts only 8 minutes. The taxi ride into town had taken us 50 minutes with no traffic. The train only reached 300 km/hr on the journey, but it was still quite thrilling. You could feel the speed of the train, and the tracks are actually banked on the turns. Getting back to my ‘seeing is believing’ comment, I would say that as a tourist I had no idea that I have been visiting a one party socialist worker’s party state. Seeing Ferraris, Lamborghinis and Rolls Royce on the roads, seeing the billboards for upscale designer fashions as well as Beyonce promoting H&M, seeing all the Chinese dressed very individually and quite chic, spending time in the packed Apple store on Nanjing Road; and peeking down the side alleys and seeing quite grey and Spartan living conditions, all this speaks of a society plugged into the world capitalist economic model. 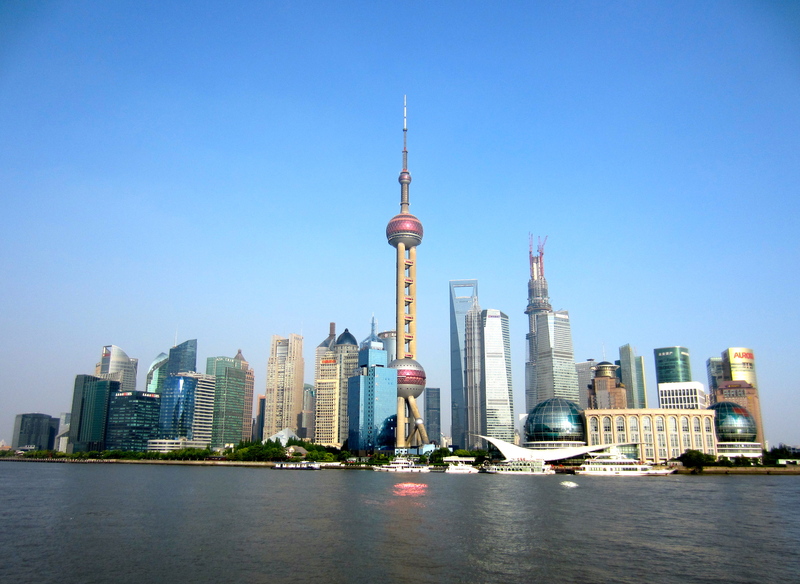 I did not find Shanghai seductive, and thus would not really consider coming back to the city, but I sure am glad that we got outside our comfort zone and took the chance of travelling here. My preconceptions of China are past history. Our boys, too, now have a firsthand view of the present and future China. Feeling very lucky and grateful that I had the presence of mind this morning to click the “Travel Documents May Be Required” button as I was printing our tickets for China. After all the countries we visited this year, HOW could it not occur to us that we needed a visa to enter China! So, three hours later after filling out over 30 pages of forms and printing copies of all of our passports, hotels, flights, contacts, etc..we rush down to the Embassy and prayed we could get an “urgent” order – we leave on Thursday! We had been warned that the China Embassy was very disorganized and we could wait for hours. To the contrary! We were greeted at the entrance where our documents were reviewed for completeness, given a computer generated queue number, and showed to the waiting area. We were number 3 in line and out of there in 20 mins. And, our visa would be ready at 9am in the morning! Downside…urgent processing fee cost an extra $100 per visa – ouch! I guess it could be worse…loss of all the deposits and air fair costs if we couldn’t get to China. So, Bob and I breathed a sigh of relief and did a little “high 5″ as we left the building. Great team work even if our brains were on autopilot. 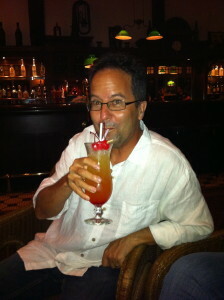 My swedish friend Per texted me that if I was in Singapore I would have to get a drink at the bar at the Raffles Hotel. Apparently, he had tried to do this, but was denied admittance because he was wearing shorts. I would have a drink at Raffles for him. Bernie, Pearl, Gigi and I went out for a Saturday evening of music on the town last night. We heard some great blues and rock and roll at a place called the Barber Shop. This restaurant club is located behind the Asian Civilizations Museum in the old British administrative area of town. Saturday night was jam night, and several guest players were taking turns getting up and playing. The quality of the music was excellent for a bar band. Drinks were 18 $Sing! (almost 15 $US) When the band took their break, we paid our bill and took a walk over to the Raffles Hotel. The walk over to Raffles passed the white painted cathedral on our left and the town’s cricket pitch on the right. The historic buildings were all only a few stories in this district. Looking at the high rises flanking this area, Bernie made the comment that the land value of the cricket pitch was probably one billion dollars. The Raffles Hotel was another two story, white colonial building with dark stained wood accents. We found the Long Bar at the back of the building. It was maybe half full with patrons, and a band was playing on the upper floor. I ordered a Courtyard Singapore Sling, which had lychee flavoring in it. It was bloody awful! I could not believe that the bar that was famous for inventing the Sling would produce such a sickly sweet, unbalanced concoction. And it cost 26 $Sing!!! This was the most expensive drink I ever had. Ah well, I was in a lighthearted mood, and instead of sending the drink back I braced for its syrupy thickness as I focused on the flavor of the lychee each time I took a sip. What the hell, it was only one drink. A very enjoyable night out on the town in spite of the two drink 44 $US bar bill. Oh yeah, and this was the first time Gigi and I wore our jeans in Singapore. Singapore has been our base and home in SouthEast Asia. In total, we are spending a month here with our friends Bernie and Pearl. Really, the boys favorite thing to do here is to chill out in the house and play Mindcraft. But hey, they can do that anywhere, so we are constantly pushing them to ‘get off the screens’ and go out and do things. A trip to an air conditioned movie theater easily motivates them. We have seen Iron Man 3 and The Croods with them. This is a real treat for the boys, as we have not gone to see hardly any movies in theaters on this trip. But there you go again, something that we can do at home. Not really special to Singapore. Ski360, I would say, fits the bill as an activity that is especially Singaporean. 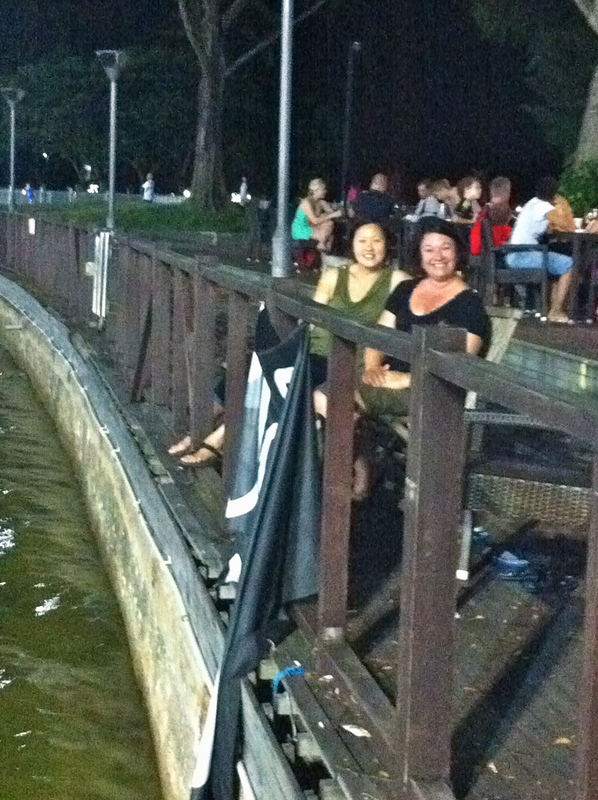 It is modern, water-based, and athletic; a venue that is our boys favorite place in Singapore. 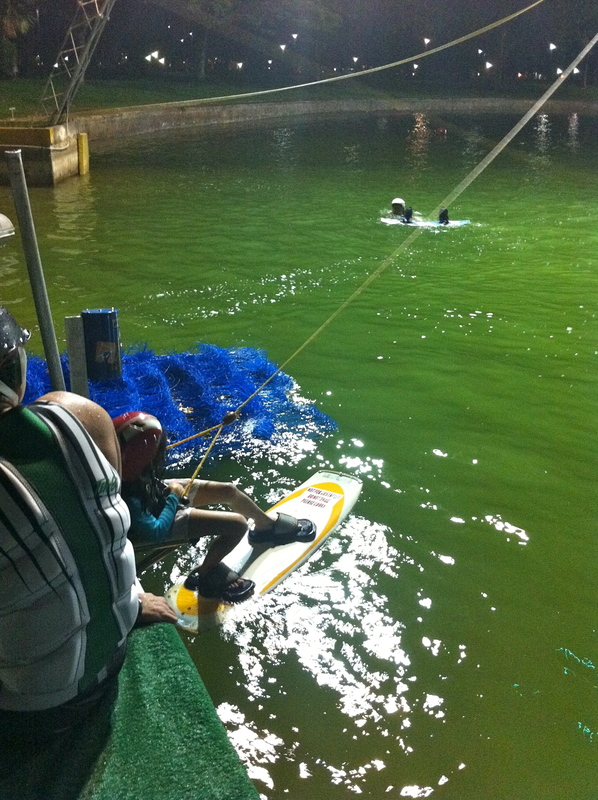 Ski360 is a cable tow wake boarding venue. The cable runs above a huge salt water lagoon that is dotted with skate park style ramps and jumps. Maybe 6 people can be out wake boarding at the same time. It is the size of two football fields. Fall on the far side of the lagoon and you have a long walk back to the starting point. There is a launch ramp that everyone takes off from. Music is blasting from the sound system. Young people with blond dyed hair and ear lobe plugs fit you with the gear. Ski360 is located in East Coast Park. A wide promenade separates the lagoon from the ocean where hundreds of cargo ships are anchored, waiting their turn at the container port a few miles to the west. Just beyond the far end of the lagoon is the East Coast Lagoon Food Village. Our first visit to Ski360 was on a Friday evening. 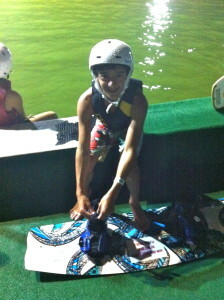 Jordan, Justin, Izzy and I all went wake boarding. Jordan and Justin have had one chance previously to wake board at Lake of the Pines prior to this. Neither could get up. I wondered how this was going to turn out for them. We all started on Easy Up boards, which have a high foam content and thus are more buoyant than regular wake boards. I got up on my second try. The tow rope gives quite a sudden jerk when it engages with the tow cable. It took Jordan maybe 10 dogged attempts, but he finally got out on the water. Justin never did get up, but he did not consider this a negative in any way. He would pop his face up and and with a big smile immediately start talking about what just happened as he paddled the twenty feet back to the ramp. He never got tired of crashing. It was the ‘best time’ according to him. Jordan meanwhile was trying to make 5 loops around the lagoon, which was not easy. In addition to us simply being very unsteady on the boards, there were 5 turns to the cable circuit that really whipped you, and often at these junctures we novices were most likely to fall. The boys boarded for two hours, past sunset. When we were done, we all went to the ECL Food Village for a hawker meal dinner. The evening was pleasant and the place was packed. 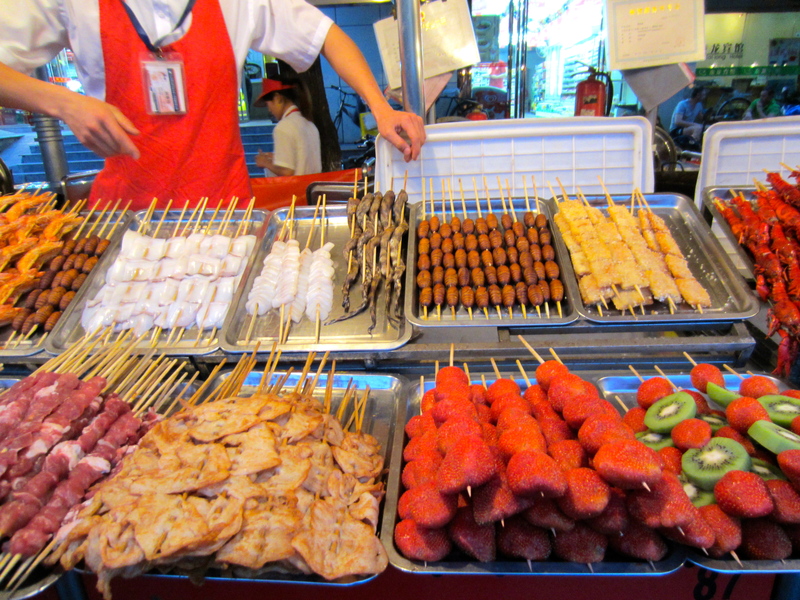 We ate a smorgasbord of chicken satays, grilled stingray, wok fried noodles, beef rib soup, and chicken rice. The next Friday found us visiting Ski360 again. The boys had been asking for it all week. 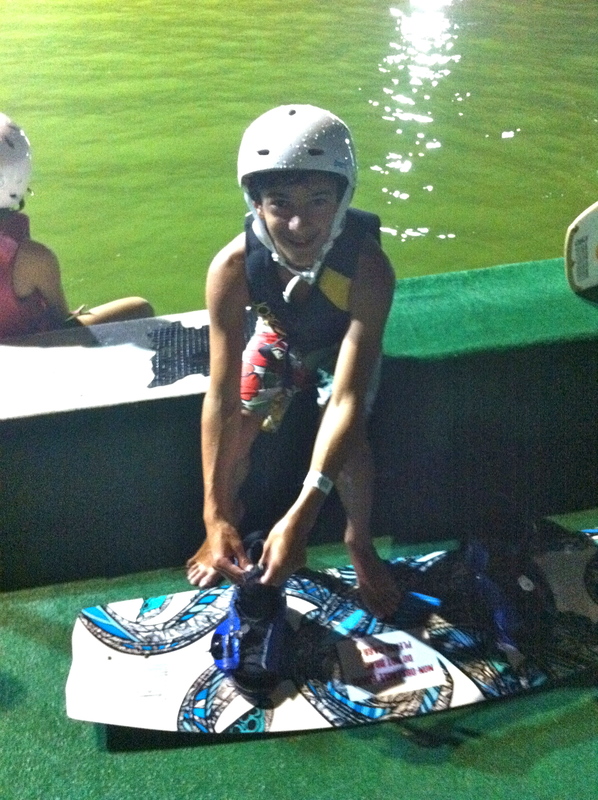 This visit Jordan upgraded to a regular, finned wake board. Over the 2 hours he logged lap after lap on the lagoon. Justin never did make it up, but that did not matter. 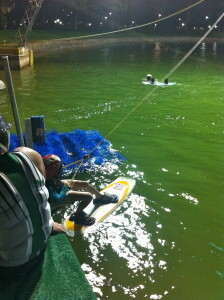 He found a New Zealand expat 9 year old boy who was having similar difficulties with the wakeboard. 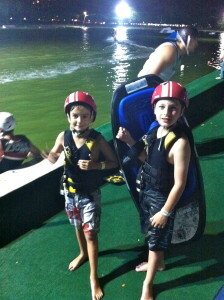 They traded their wake boards in for a knee board and got out on the lagoon as a tandem. They never made it around the first turn, and always had a long walk back, but they really didn’t care. They enjoyed wiping out. When we get back home, I know we will be spending time at Gigi’s family house in Lake of the Pines. The boys will be knocking on the neighbor’s door, asking Paul if he wants to take his boat out on the lake so the boys can go wake boarding. If we had known about Nusa Lembongan Island at the beginning of our trip, well, we would have skipped Seminyak and just come here. Actually, we did know about Nusa Lembongan, but only from what we read in the Lonely Planet guide. Famous for diving and advanced surf breaks, and not having ATM machines. Also, the boats drop you off on the beach, you put your shoes in a box and jump into the water to get off the boat. When you read travel guides, in spite of how well they are written, you often just don’t get a feel for a place. 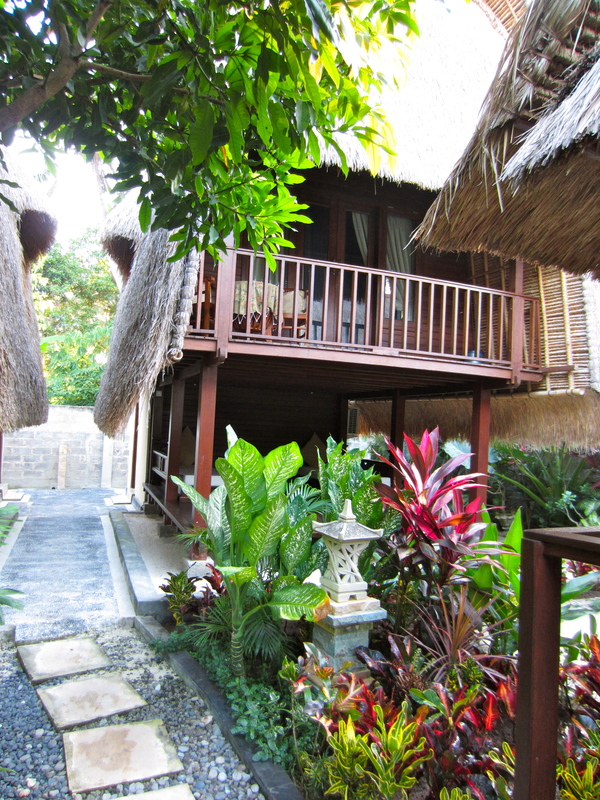 After reading the Lonely Planet guide, we were thinking Nusa Lembongan would be too rustic for us. How misinformed our first opinion was! 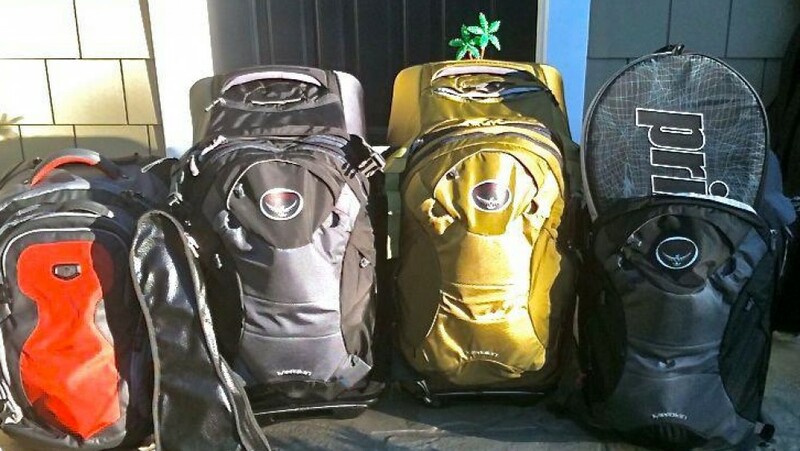 We had left the last four days of our trip open because we really did not know Bali, and that after two weeks in country we would have a better idea where we really wanted to go. We left the decision until the final night at the Swallow Guesthouse. There were two things we had not checked off our ‘To Do’ list – surfing lessons and snorkeling. Seminyak beach did not offer good surf for beginners, and the surf break we had seen was large and way out on reefs. Not the type of thing for beginners, and Gigi and Justin were not even part of the want-to-learn-to-surf equation. That left snorkeling. Amed on the northeast coast got high ratings for snorkeling from both the Lonely Planet and local expats we had talked with. 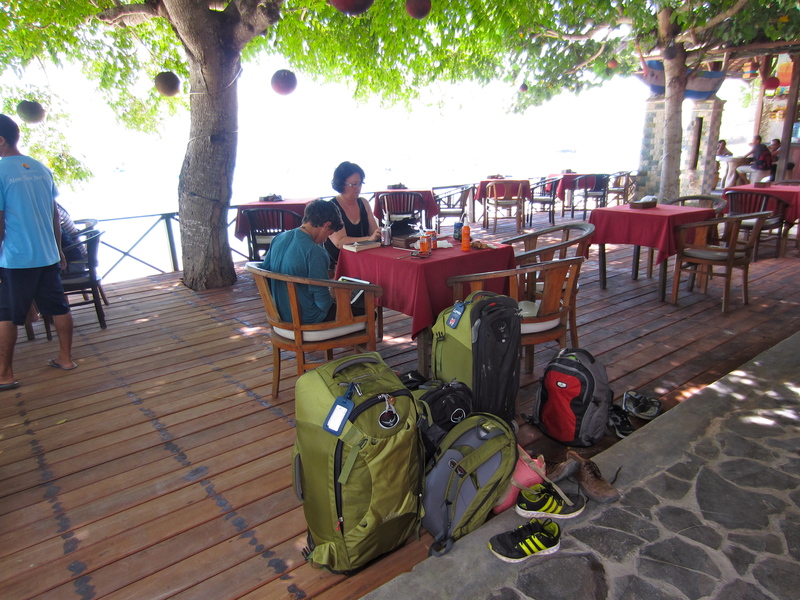 The downside of Amed was its location which would make for a longish trip back down to Sanur and the airport. Also, we were told that without a car, you were pretty isolated and stuck at your hotel. Amed was loosing its pole position. 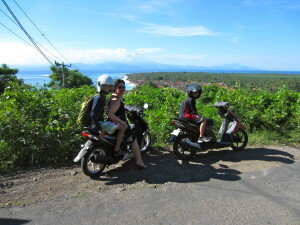 Nusa Lembongan, however, got high marks from a few expats we spoke with. Being right across the water from Sanur made it a short trip to get back to the hotel in Sanur for our last night in Bali. The snorkeling was supposed to be good (it was – see Jordan’s blog). So, our last night we changed plans and told Wayan at Swallow House to book us a car for Sanur and not Amed. This would be the first time of our whole trip that we were arriving at a place without prior reservations for accommodations. How adventurous! 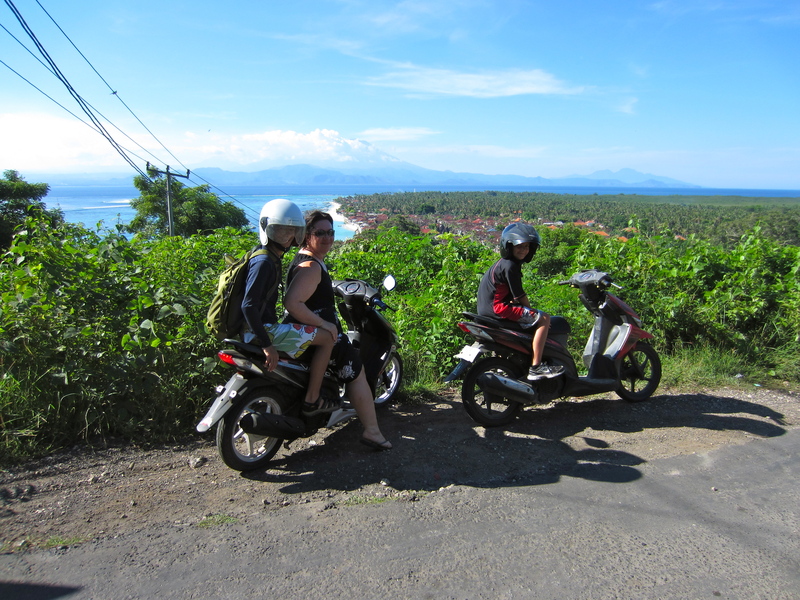 The driver dropped us off at Sanur beach the next day, and it was crowded with Sunday beachgoers. A local tout helped us find the boat ticket office. 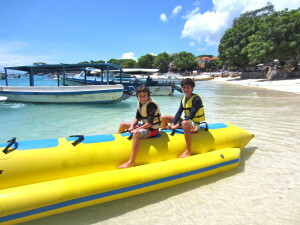 We were surprised to see that even in Sanur the boat took off from the beach. Shoes in a basket, luggage on our heads we climbed into the back of the boat. It was a ‘fast’ boat with three outboard motors and twenty minutes later we were repeating the process in reverse. At first, we were a bit disoriented because we were not dropped off at Jungutbatu as we had expected. In hindsight this was a blessing, but our first thoughts were ‘how are we going to get ourselves and our luggage over to Jungutbatu where all the hotels we had researched were located. When in doubt, head to the nearest beach cafe, have a soda and some lunch, and take bearings. We realized we liked where we were, which was called Mushroom Bay. White powder sand in a crescent around a small bay with modern and traditional motor craft bobbing in the turquoise water. Lots of large trees provided shade in the one street village. Scooters were the favored transport. No cars, but some small, flatbed trucks were around to transport groups of people. 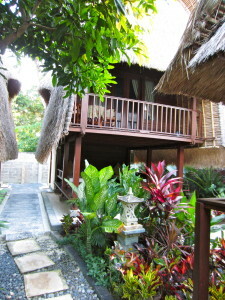 We found Nicho’s Place, a family run bungalow guesthouse, just fifty meters back from the beach. It was only six months old with 4 thatched roof, wood-walled bungalows with air con and a pool. We booked two bungalows for $30 a piece. We only committed to the first night, but ended up staying there all three nights. Our host, Made (son #2), spoke English very well as he has worked for a cruise line as a cabin steward. We talked with 3 other people who had family working for cruise lines out of Fort Lauderdale. There must be an employment pipeline for Balinese as they are so pleasant and clued into the tourism economy. We never had a bad meal in Mushroom Bay. There are at least 6 restaurants on the beach and another 6 along the one road leading inland. We ate most of our meals at the Bar & Cafe Bali Lembongan. Good music on the sound system, excellent shady deck overlooking the sand, a shower for rinsing off, and good, cheap food. By our second day the waitress was greeting Justin by name. 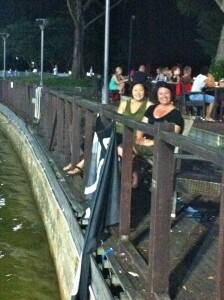 Other than eating, Gigi and I spent a lot of time lounging at the Bar & Cafe watching the boys swim in the water. We took paddle boards out one afternoon. The boys favorite activity was the 5 person ‘banana boat’ inflatable that was towed behind a motor boat. We also took a 3 hour snorkel trip in a local boat around the island and stopping at 3 different snorkel spots. We rented scooters for two days and toured the island. There was some serious poverty on the north side of the island where villagers living in houses made of woven bamboo and thatch made a living from harvesting seaweed. We had the pool at the bungalows to ourselves. One night we went to Bar Barbarella for the ’7:30 movie night’ that was advertised. It was just the four of us and we watched Total Recall on the flatscreen behind the bar. Mushroom Bay has a lot of day trip tourists coming over from Sanur, but at this time of year there were only a few tourists around at night. On the wall was a large framed marque poster of the movie Barbarella. Gigi and I giggled about the bar’s name when the boys were not listening. The barman had a copy of the movie and offered it as an option for viewing. Not quite family material. The only downside to the stay was when I poked my eye on a pointy palm frond in our outdoor bathroom. The next morning my eye was already infected. Thankfully, Made took me on his motor bike to Jungutbatu to the medical clinic where the doctor immediately said, ‘Conjunctivitis? Infection!’ and gave me drops and 3 different tablets to take. I thought it was overkill, but my eye was swollen and watering and I did not want to take half-measures to cure it. Luckily, by today it is almost healed. Having had such a nice time here, I find it sad that this little sliver of tropical paradise is so far away from California.